Hardscaping it the inclusion of non-living materials to your landscaping such as wood, stone, metal and concrete. It can serve as a visually powerful compliment to your traditional landscaping or "softscape" which includes the trees, flowers, shrubs and plants that provide a natural beauty to your landscaping. The addition of hardscaping to your landscape is an excellent way to enhance your outdoor living space. Hardscaping projects can be big or small and often require significant planning and installation time. Regardless, each hardscape feature adds beauty, style and value to your landscape. AJ's Landscaping specializes in the design and installation of many different types of hardscape. The following summary explains some of our expertise and explains the benefit of hardscape landscape construction. If you are looking for a delightful place for entertaining and getting lost in the company of quite time or a good book, then a Patio would be an excellent addition to your outdoor living space. Patios are also an excellent way to increase the value of your home. AJ's Landscaping can install patios close to an entry in and out of the house, or as an island in the middle of your yard. Fire features are a popular outdoor living trend today. They offer a warm opportunity for your yard and can be a great place for friends and families to congregate. They help add a social feel to your landscaping and can serve as a relaxation spot or can turn your yard into a romantic destination. 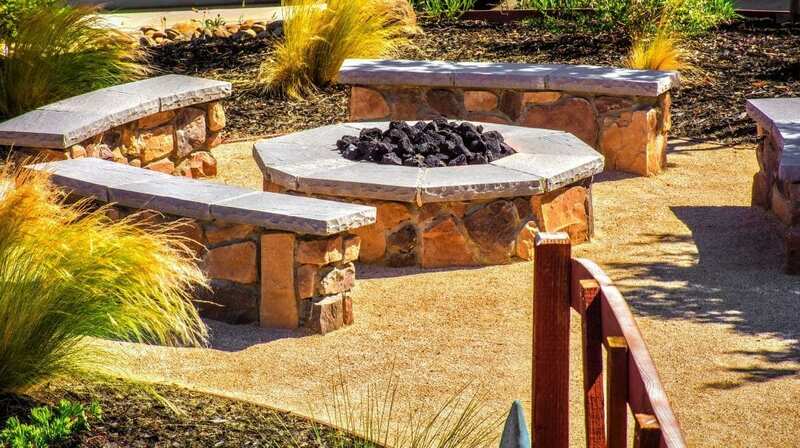 If you like entertaining small groups of people, a fire pit is an excellent option to add to your landscaping. AJ's Landscaping can help with the material selection, design and installation of your fire feature. The fastest way to add a peaceful and calming effect to your landscaping is with the addition of water features. Waterfalls, small ponds, water fountains and water walls are impressive statement pieces when added to any landscape. Water features bring your landscaping to life and can be implemented in a variety of ways. AJ's Landscaping has many years of experience designing and installing outdoor spaces, hardscape and softscape combinations. We know the right materials t use for your vision and we can include hardscape landscaping in your landscape. If you are considering including retaining walls, outdoor fireplaces, fire pits, and patios to your landscaping, contact AJ's Landscaping today!